The Alzheimer’s Impact Movement, the Alzheimer’s Association and our nationwide network of dedicated advocates are celebrating breaking news from Washington – federal research funding for Alzheimer’s at the National Institutes of Health (NIH) has received a $400 million increase in the FY2017 budget. We first shared with you the Senate Appropriations and House Appropriations Committee’s intent to once again pass an historic funding increase in the summer and today it was officially signed into law by the president. Today’s news would not be possible without the work of AIM, the Alzheimer’s Association and our advocates. Since last year, we have held thousands of meetings with members and their staff requesting they invest at least an additional $400 million in Alzheimer’s research funding. Thanks to bipartisan leadership in Congress, today Alzheimer’s research has reached nearly $1.4 billion at the NIH. This bipartisan effort was spearheaded by Senate Appropriations Labor, Health and Human Services, Education and Related Agencies Subcommittee Chairman Roy Blunt (R-Mo.) and Ranking Member Patty Murray (D-Wash.), and by House Appropriations Labor, Health and Human Services, Education and Related Agencies Subcommittee Chairman Tom Cole (R-Okla.), and House Appropriations Committee Ranking Member Nita Lowey (D-N.Y.). This marks the second consecutive year that Alzheimer’s research funding has been singled out for historic funding increases. Still, more work remains. Today, Alzheimer’s costs the nation, $259 billion in 2017, with $175 billion coming in direct costs to Medicare and Medicaid. The Alzheimer’s Association estimates that by mid-century the cost of Alzheimer’s is projected to more than quadruple to $1.1 trillion. Yet, despite today’s funding increase, Alzheimer’s research funding at the NIH is still well below what is needed if researchers are to meet the primary goal of the national plan to find a method of treatment or prevention by 2025. Demonstrating the urgency of this crisis, the NIH Professional Judgment Budget commissioned by Congress has already recommended a $414 million increase in spending on Alzheimer’s disease research for fiscal year 2018. The Alzheimer’s Association and AIM are already working to ensure that today’s increase is not the last. Just last month, a record-breaking 1,300 advocates from across the country came to Washington, D.C. for the Advocacy Forum and asked Congress to continue to act. Please join us in thanking Congress for taking decisive action today and urge them to remain our partners in the fight to end Alzheimer’s. When my husband Jim, who just turned 53, was first diagnosed with younger-onset Alzheimer’s disease, I wasn’t quite sure what was going on. The doctor didn’t tell us Alzheimer’s is fatal. He didn’t tell us there is no cure or that we should get our affairs in order. He didn’t tell us how long Jim might have left. He simply said, “See you back in six months.” If you are lucky, your doctor might refer you to the Alzheimer’s Association. I had to find it on my own. We couldn’t tell anyone. Jim didn’t want to. He had a top security clearance job. He had a mother that had passed away from this very same disease. He knew more than I did. He kept up with his normal routine. He kept living as if there were a million tomorrows. At the same time, I was starting to live as if there was no tomorrow. I grasped for anything I could that might keep Jim with me—seizing every opportunity to discuss plans and outcomes and new treatments and experiments and research. I was clutching every snippet of time, trying to create lasting memories for us and our two children (who were 5 and 8 at the time). It was all so hard to take in. He seemed so healthy and fine 95 percent of the time. He was handsome and athletic and smart and rarely got sick. How could it be that in just a few years, he would be taken from me? From his children? From everyone who loves and cares for him? For a few very long and stressful years, we kept this secret. Maybe the doctor is wrong. Maybe it is a tumor. Maybe it is mini strokes or a thyroid problem or high blood pressure. Couldn’t it be something as simple as lack of sleep or depression? Then Jim’s brother was diagnosed with Alzheimer’s and subsequently passed away at the very young age of 52. It became apparent to me—to us—that this does indeed run in Jim’s family. That is when it dawned on me; our children are susceptible to this disease. This nightmare could return to our family again and again unless something is done. We had long discussions about our future, our options, our finances, how to tell the kids. Then Jim lost his job. We had more long discussions. Jim started having more and more symptoms. Then we decided it was time: time to be part of the solution; time to join the cause; time to make sure the whole world understands what a horrible and heartbreaking story we have along with MILLIONS of others. Three years ago this month, we joined hundreds of advocates from around the country in Washington D.C. for the annual Alzheimer’s Association Advocacy Forum. We weren’t quite sure what to expect. I was nervous. Although we had been to D.C. numerous times, we had never tried to speak to a member of Congress before. We had never gone through security to enter a building on Capitol Hill, or walked the marble halls. We listened to the echo of our footsteps as we marched closer and closer to the offices of elected officials who can help change the future of this disease—the future that awaits our children. I was encouraged to share our story. And so I did. And I cried. And Jim cried. Others in our group cried. It was a relief—a relief to be heard; a relief to be doing SOMETHING to make a difference; a relief to get it behind us. But we hadn’t really gotten it behind us. Jim was still diagnosed, there still was no cure or real treatments or preventions. Which is why last year, we marched ourselves right back to D.C. again. We weren’t as nervous. We knew the routine. We were prepared. Now, another year has gone by and there is still no cure, no treatments to slow its progression and no prevention. More federal money has been given for research, but not nearly enough (BILLIONS short) and absolutely no new programs and financial help for those of us struggling each day to pay bills and to take care of loved ones afflicted. So, last week, Jim and I once again descended upon our elected officials to ask for help as part of the Advocacy Forum. We met with Sen. Mark Warner (D-Va.), Rep. Scott Rigell (R-Va) and asked them to support an additional $200 million dollars for Alzheimer’s research and to co-sponsor the Alzheimer’s Accountability Act. Both of the Congressmen we met with have supported this cause in the past by signing on to co-sponsor the Hope for Alzheimer’s Act. One is a democrat and one is a republican. They are both businessmen. They understand the damage this disease is doing to our country and our Medicaid system. They understand the dire straits we will all be in if a change doesn’t happen. They both agreed to continue to support us and to be champions for Alzheimer’s families. The Alzheimer’s Association Advocacy Forum is a great way to be part of something so much bigger than ourselves. It is a way to connect with other families from around the country who face the same struggles and the same loneliness and the same frustrations. We have made friends whom we now keep in contact with and support year round. And each year we meet new friends and are able to rally around them and show them the ropes (so to speak). Believe it or not, there are even advocates that fly to D.C. to participate who have no connection to Alzheimer’s or other form of dementia. They may work with the elderly or be a student who hopes to become a researcher. For other advocates, the connection may not be direct—they heard a friend of a friend suffered through this disease and decided to support the cause. Each year, the awesomeness of the human race amazes me. It is sometimes hard to remember this when you watch the news or get mired in one bad luck scenario after another. But there are good people in this world who care and who are giving of themselves unselfishly to help others, even for people they don’t know and may never know. I am proud to be part of this and I know Jim is, too. The three days we were in D.C. were the liveliest and most energetic I have seen him in months. He was joking and talking and enjoying himself. It makes him feel like he is helping his children. He is helping humanity. He is stopping the very thing that is taking him away from everything he holds so dear. There is power when we work together. I encourage everyone to contact their representative. Let your voice be heard. Let them know we demand a change. We demand a cure. We demand a different future where families are not suffering from Alzheimer’s disease. 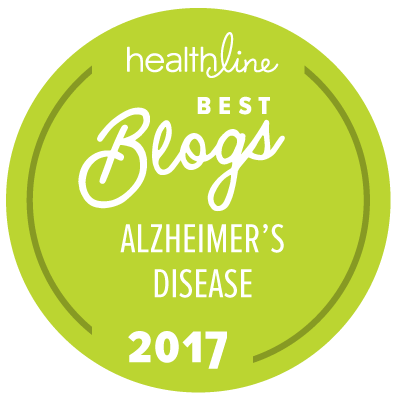 About the blog author: Karen Garner, mother of two, works full time and is care partner for her husband, Jim, who is living with younger-onset Alzheimer’s. She shares her journey through her blog, Missing Jim.